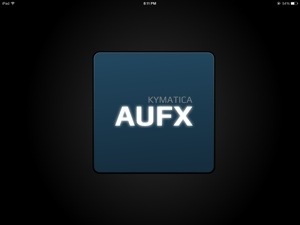 The AUFX series’ second installment is a multi function delay unit Kymatica calls “Dub”. When I see that word “Dub”, I think of DubStep, or poorly voiced-over foreign films. In this case, I think DubStep is the relevant comparison however, Dub is so much more than a DubStep styled delay, or wobble effect. This really is a full service delay FX app. 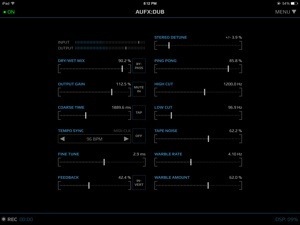 AUFX:Dub is a high quality, 32Bit DSP, delay effects app that also happens to perform DubStep-styled wobbles, and filtered warbles. It is a versatile collection of parameters bundled to enable the user a quick and easy means of crafting some delay types-like the clean digital stereo delay, dirty noisy tape delay, and of course wobbling and filtered DubStep effects. Easy is the perfect descriptor of this app, and all of the AUFX series. A very classy and simple interface of intuitive sliders on a black background. That’s it. What more do you need anyway? It’s the results and quality that matter, and that’s what you will get. Great results that sound great too. 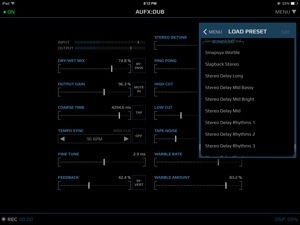 Dub is Inter-App Audio*, (*IAA requires iOS 7) and Audiobus ready for all slots. Input, Effects, and Output. Fully MIDI and virtual MIDI controllable, with supports for Background Audio, AudioShare, and Email recordings. To make things even easier, Dub is preloaded with numerous preset effects to choose from. Each preset is aptly named and does what it describes. Additionally you can create, save, and share your own concoctions with other users. 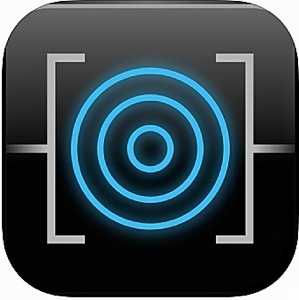 This is a simple, but very effective echo/delay FX app that can be used on most any iOS device without issue. Dub is easy on the CPU while managing to reliably create complex effects without crashing your device. All at a low cost but without any compromise on the quality. There is nothing cheap about AUFX apps. So in honor of the simplicity of this AUFX entry, I will keep my review just as simple by ending it in the next few sentences. It doesn’t take a lot of creative verbiage to get the point across. You don’t need me to write a bunch of paragraphs full of creative words to basically end up saying: this is an excellent app, you should buy it. What did you expect? A poem? HoldernessMedia, known for its excellent EchoPad delay app brings us a new stand alone Flanger/Fuzz effects app: Swoopster! 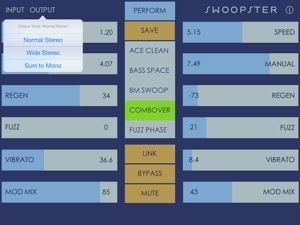 Swoopster is a versatile Flanger effects app with an intuitive interface designed well for performing and recording alike. It is compatible with professional-grade USB adaptations, or easily used as an effects unit with Audiobus or Inter-App Audio (iOS 7 required for IAA) in your favorite iDAW. In addition to being a Flanger, it can produce some very fuzzy, er…Fuzz, and each channel can be independently tweaked. Swoopster is controlled nicely with 4 X/Y pads. 2 for the left and right Flanger, and 2 for the left and right Fuzz. Each effect can be linked so that both channels are controlled by movements on either the left or right pads. 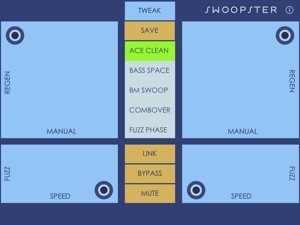 Swoopster has familiar DJ style “momentary” buttons to mute, or bypass only when touched. The interface has a very clean design and is a cinch to use in any situation. Plus it’s easy on the eyes with no unnecessary visual fanfare, allowing a very productive experience with no fuss. The center of the performance screen has some preset parameters showcasing Swoopster’s various effects combinations to call up on a tap. Careful you don’t hit one of those during a live performance. You can save and rename your own to replace the factory presets but be sure you are on the “Tweak” page before you try to save and rename. What’s an effects unit without customizable parameters to design your own sounds? 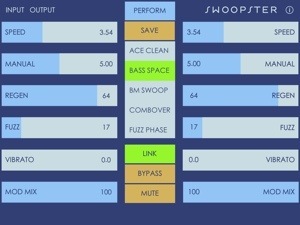 Of course Swoopster has the appropriately named “Tweak” screen full of the relevant parameters for you to manipulate. 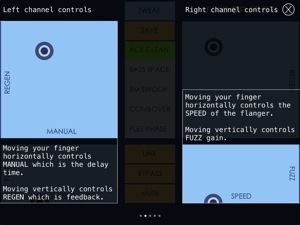 On this screen you have adjustable sliders for each left and right parameters of the Flanger and Fuzz sections. Again, linking is possible here. Unlink everything and you can really freak out with some sweet effects. Bounce around, Flanger on one side clean on the other, or whatever. It’s a lot of fun experimenting with independent channel effects. I personally found this capability to be most interesting. 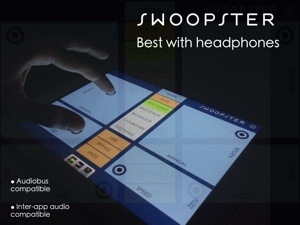 Swoopster is simple looking and complex sounding. Audio input and output each have a few different options, catering to whatever sound you want or need depending on the circumstances. Using a mono microphone like iRigMic is no hindrance at all and the app’s input and output settings provide options to give a nice stereo sound quality. The “Wide Stereo” output setting really is expansive, and dramatically wider than the capable “Normal Stereo” setting. Overall I have found Swoopster to offer a fantastic Flanger effect. I imagine it will be more popular with guitarists, but it has done a bang up job with my iOS synths as well. It has a quality sound that brings a lot to the Stand Alone Effects apps table. Smooth, wide, comb filtered, sweeping Flanger sounds, to wild super fast vibrations and anything in between are a touch away. The Fuzz effect is big. Although Fuzz is not something I’m a huge fan of, I can still hear the quality. It’s thick, big, scratchy, and in some cases booming and brutal. Great for guitars. It also can be tweaked to a wide range of fuzziness. Though subtlety isn’t its (Fuzz’s) best suit. Combine both the Flanger and Fuzz or use each alone, whatever you want. It is more than just a Flanger/Fuzz. Crank it up and have some great sounding fun. Swoopster is able to be as Yanni, or as DethKlok as you want.